作者: pal993 時間: 2018-2-14 07:55 標題: 嘉信 AMGEN INC的通知需要回覆嗎? 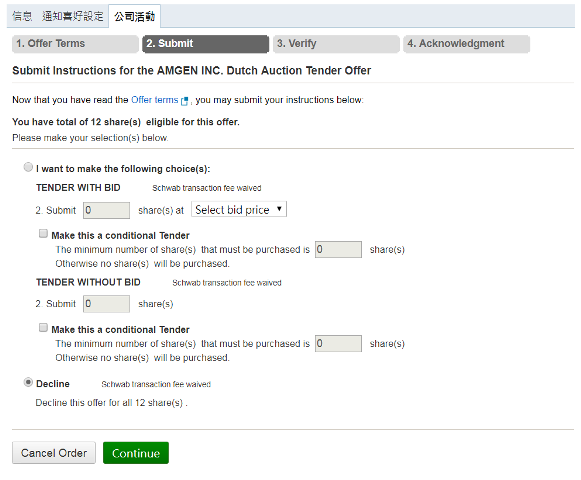 Dutch Auction Tender Offer. We must receive your response by March 1, 2018, 7:00 p.m. ET.You hold 12 share(s) in this account. questions regarding this Offer or for a copy of the Offer to Purchase please contact D.F. King & Co.,Inc. directly at (877) 864-5059.
by the Company in the event the Offer is prorated. and your shares will remain in your account. value of its common stock through a modified Dutch Auction process. purchase price of up to $10,000,000,000 (the Purchase Price). note, however, this could result in the purchase of your shares at a price as low as $175.00 per share. shares are conditionally tendered must have tendered all of their shares. number specified by the shareholder, none of that shareholder's shares will be accepted in the Offer. conditions. The Company reserves the right to amend, extend, or terminate the Offer. Tendered shares may be withdrawn at any time prior to the Expiration Date but not thereafter. thereof would not be in compliance with the securities or other laws of such jurisdiction. AMGN) before deciding whether and at what price or prices to tender their shares. any decision is made with respect to this Offer. February 15, 2018, regardless of whether such stockholder tenders their shares in the Offer. It is your responsibility to ensure you submit instructions by MARCH 01, 2018,07:00 P.M. EST . Please submit instructions even if you want to decline this offer. Call Schwab for questions about submitting instructions at 800-435-4000.